I did the 77nd Annual Craftmen's Fair which ran from Aug 7 to 15th. It was long, as usual, and I joke that it is not just a craft fair, but a marathon since I usually spend 3 weeks up at Mt. Sunapee for the fair, not a week and half that most craftspeople do. I did the floor plan and exhibition layout for CraftWear before I put up my booth. This year was full of surprises for me. For my Living with Crafts submissions, I had a pair of candleholders made of curly copper wire all woven together, plus a pair of salad servers and a set of 4 sterling egg spoons that were a collabration with Sarah Burns's ceramic egg cups/dishes and tray. Much to my surprise, I won the Joe Tucker Best in Metals award for my candleholders, called Medusa's Sisters, which is a tough award to win. For CraftWear, I had two necklaces and a pair of painted brass shoes. 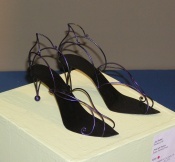 I thought it would be fun to have a pair of shoes made of metal instead of the usual piece of exhibition jewelry. Again, much to my great surprise and delight, my shoes were bought for the League of NH Craftsmen's Permanent Collection. Of all things I made, it was the shoes that made it. I am a frustrated shoe designer - got to let that out of the bottle. I can do so much, but my main medium is metal. For Sculpture Garden, I thought it would be fun to blow up one of my little nail hedgie birds and make a really big bird for the garden. Well, blue bird got a lot bigger than I planned, and he is 5'7 long, 3' tall, and 2' wide, all in various shades of blue, and called Lophodino Bird, which means crested dinosaur bird. Not sure what I'll make for next year. As usual, I had my corner booth in my favorite corner, back of Tent 4, facing the mountain and lots of cool breezes. Here's a pic of my black booth, hosting my jewelry, flatware and a small army of hedgie birds. Even my hedgehog, Cal, made an appearance, and you can see him posing with the "I love it here" NH logo. Cal was a very popular boy, and for days afterwards, people kept coming to my booth asking to see the hedgehog. Overall, the fair was good, the weather cooperative for the most part. Opening Day was great, with beautiful weather. By Day 8, I had cabin fever from being in my booth so long. It was good, but I'm glad it's over. If you never made it to the fair, here's some pics for you to see.